Nectarines and peaches are very similar – the trees look alike, they are susceptible to the same insects and diseases and both can have either yellow or white flesh. They also both have a wide range of climate adaptability and many subtle taste distinctions. Botanically, peaches are Prunus persica and nectarines are Prunus persica nucipersica. There are, however, some notable differences. Nectarines do not have fuzzy skin and they have a very distinctive flavor all their own. The most recent breakthroughs in nectarine breeding involve the white fleshed varieties. The Zaiger family, who have introduced many new fruit varieties in the last twenty years, are responsible for the Arctic series which includes Arctic Blaze, Arctic Glo, Arctic Jay, Arctic Queen, Arctic Rose and Arctic Star. These are all delicious white fleshed nectarines. The ripening season starts with Arctic Star (the lowest chill variety) in mid to late June and ends with Arctic Blaze which ripens in late August. You can have an extended nectarine season by planting carefully selected varieties. For example, Independence ripens in late June, Harko early July, Fantasia in late July to early August and Liz’s Late ripens late August to early September. If you would like to receive a fruit ripening chart to help you plan this kind of successive harvesting, send us a self-addressed business sized envelope with a first class postage stamp. The white flesh peaches and nectarines tend to be sweeter than the yellow fleshed varieties. For those of you with a fruit sweet tooth, we offer a multiple budded tree with white fleshed varieties of both nectarines and peaches. Refer to the section on Multiple Budded Fruit Salads. You can substitute nectarines in any peach recipe and there’s no need to peel the fruit. 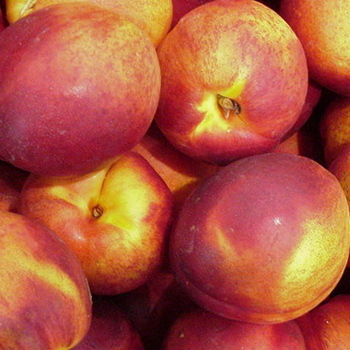 Nectarines are excellent in pies, tarts or chutney and they’re delicious sliced and served over ice cream or pancakes. In our climate, peach leaf curl, a fungal disease that attacks both peaches and nectarines, is a real problem. Areas with cool, moist springs are generally affected. The suggested treatment is a spray of copper sulfate (at least 90% copper) applied during the tree’s dormant season, December through February. Spray at least twice during this period, three times if possible. The last spray should be applied just prior to bud opening. This treatment is also effective for another fungal disease, brown rot of stone fruit. Nectarines should be pruned in the same manner as peaches. Once you have established your main structure, take down approximately 2/3 of the growth every year, either by cutting back or thinning. Thin out the small fruit as well, to avoid a harvest of under-sized nectarines. If you have a problem with birds and don’t wish to net your trees, we offer Holographic Scare Tape (see Orchard & Garden Supplies). Peaches and nectarines dwarfed to 8-14 ft.; apricots and plums dwarfed to 12-18 ft. Very tolerant of wet soil; not drought tolerant (induces early dormancy in dry soil) so needs very regular water in hot climates. A top dressing of mulch can help maintain soil moisture. Resists root knot nematodes. Induces heavy bearing at a young age. Very winter hardy. Strong and well anchored. Pat. No. 5112 (Zaiger). NOTE: For areas with very hot, dry climates we do not recommend Citation root stock. We have had reports from customers in Texas and Arizona who have had much better luck with Nemaguard. We realize some of the varieties are only offered on Citation and, if you wish to plant those varieties, be sure to supply adequate irrigation. Vigorous, standard rootstock for plums, peaches, nectarines, apricots, prunes, almonds. More tolerant of wet soils than Nemaguard; also more cold hardy. Susceptible to nematodes in sandy soils. Provides good anchorage and high degree of disease resistance. Unpruned tree height of standard varieties 15-25 ft.; size can be controlled further with summer pruning. Standard rootstock for nectarines, peaches, apricots, plums, prunes, almonds. Vigorous, resists root knot nematodes. Excellent for well drained soils. In heavy or poorly drained soil, plant on mound or hill. May not be winter hardy below 5°F. Unpruned tree height of standard varieties 15-25 ft., but size can be controlled further with summer pruning. The first miniature white fleshed nectarine, the result of interspecific breeding by Zaiger! Extremely sweet with large fruit. Grows four to six feet tall. Ripens late May to early June. 700 hours or less. Self-fruitful. (Zaiger) Available on: Lov. Large yellow freestone nectarine with sweet, delicious, refreshing flavor. Ripens in mid August. Heavy bearing 5-6 ft. tree, easily covered to protect from frost. 500 hrs. or less. Self-fruitful. (Zaiger) Available on: Lov. Sweet, firm, flavorful, yellow freestone nectarine with beautiful red skin. Best self-fruitful miniature nectarine. Ripens mid June to early July. Strong, vigorous tree to 6 ft. 400 hrs. or less. Self-fruitful. Pat. No. 6283 (Zaiger). Available on: Lov. Excellent quality, mid season, yellow freestone nectarine with sweet, rich, delicious flavor. Heavy bearing 5-6 ft. tree. Ripens in July. 400 hrs. or less. Pollenized by Honey Babe or other peach or nectarine. (Zaiger) Available on: Lov. Taste test winner. One of the best of the low acid, white fleshed nectarines. Fruit has rich flavor and firm texture in early season, is very sweet when soft ripe. Large freestone to semi-freestone fruit has red and creamy white skin. Harvest mid to late August in Central California, after Arctic Queen white nectarine. Estimated chilling requirement 700-800 hrs. Self-fruitful. Pat No. 10174 (Zaiger). Available on Lov. Exciting sprightly sweet, early season white nectarine. High scoring in taste tests; nice balance of sugar and acid with very appealing flavor. Has red skin and very unusual crimson streaked white clingstone flesh. Highly recommended for home orchards. Ripens late June/early July. 400-500 hrs. Self-fruitful. Pat. No. 7884 (Zaiger). Available on Lov. Exciting sprightly sweet, early season white nectarine. High scoring in taste tests; nice balance of sugar and acid with very appealing flavor. Has red skin and very unusual crimson streaked white clingstone flesh. Highly recommended for home orchards. Ripens late June/early July. 400-500 hrs. Self-fruitful. Pat. No. 7884 (Zaiger). Available on Cit. Taste test winner. Very attractive, firm, freestone, white fleshed fruit is richly flavored, with a balance of sugar and acid. Ripens in July, between Arctic Glo and Heavenly White nectarines. 500 hrs. or less. Self-fruitful. Pat. No. 9908 (Zaiger). Available on Lov. Taste test winner. Very attractive, firm, freestone, white fleshed fruit is richly flavored, with a balance of sugar and acid. Ripens in July, between Arctic Glo and Heavenly White nectarines. 500 hrs. or less. Self-fruitful. Pat. No. 9908 (Zaiger). Available on Cit. Delicious, new, low acid, super sweet, freestone white nectarine. Very similar to Arctic Rose, but ripening 3-4 weeks later (early to mid Aug. in central Calif.). Has rich flavor and nice crunchy texture when firm ripe, is extremely sweet when soft ripe. High scoring in taste tests. 6-700 hrs. Self-fruitful. Pat. No. 8094 (Zaiger). Available on Lov. Delicious, new, low acid, super sweet, freestone white nectarine. Very similar to Arctic Rose, but ripening 3-4 weeks later (early to mid Aug. in central Calif.). Has rich flavor and nice crunchy texture when firm ripe, is extremely sweet when soft ripe. High scoring in taste tests. 6-700 hrs. Self-fruitful. Pat. No. 8094 (Zaiger). Available on Cit. Delicious, white fleshed, super sweet, freestone nectarine. Has sweet, rich flavor and crunchy texture when firm; is extremely sweet when soft ripe. Very high scoring in taste tests; highly recommended for home orchards. Ripens mid to late July. 6-700 hrs. Self-fruitful. Pat. No. 7889 (Zaiger). Available on Lov. Delicious, white fleshed, super sweet, freestone nectarine. Has sweet, rich flavor and crunchy texture when firm; is extremely sweet when soft ripe. Very high scoring in taste tests; highly recommended for home orchards. Ripens mid to late July. 6-700 hrs. Self-fruitful. Pat. No. 7889 (Zaiger). Available on Cit. Earliest to ripen of the white fleshed nectarines. Low in acid, super sweet with no tartness. Semi-freestone, snow white flesh with beautiful dark red skin. Rave reviews in trial tastings. Ripens mid to late June. Low chill, only 300 hours. Self-fruitful. Pat. No. 9332 (Zaiger). Available on Nema. Earliest to ripen of the white fleshed nectarines. Low in acid, super sweet with no tartness. Semi-freestone, snow white flesh with beautiful dark red skin. Rave reviews in trial tastings. Ripens mid to late June. Low chill, only 300 hours. Self-fruitful. Pat. No. 9332 (Zaiger). Available on Cit. Another Zaiger success! Very tasty white fleshed clingstone fruit is preceded by intensely deep red double blooms. Ripens in mid to late June. 500 hours. Self-fruitful. Available on Nema. Proven heavy producer of delicious nectarines for warm winter western climates. Skin is solid red, flesh is juicy and yellow freestone with rich flavor. Ripens mid to late May. 250 hrs. Self-fruitful. (Zaiger). Available on Nema. Proven heavy producer of delicious nectarines for warm winter western climates. Skin is solid red, flesh is juicy and yellow freestone with rich flavor. Ripens mid to late May. 250 hrs. Self-fruitful. (Zaiger). Available on Cit. Delicious low chill, semi-freestone nectarine. Large fruit with bright red skin, yellow flesh and rich flavor. Proven producer in warm winter western climates, also recommended as early fruit elsewhere. Ripens mid June. 1-200 hrs. Self-fruitful. Pat. No. 7891 (Zaiger). Available on Nema. Delicious low chill, semi-freestone nectarine. Large fruit with bright red skin, yellow flesh and rich flavor. Proven producer in warm winter western climates, also recommended as early fruit elsewhere. Ripens mid June. 1-200 hrs. Self-fruitful. Pat. No. 7891 (Zaiger). Available on Cit. Sensational mid season yellow freestone; very high scoring in taste tests. Heavy bearing tree with very showy double pink flowers. Superb, dark red skinned fruit is sweet, with unusually rich flavor; consistently the best flavored yellow nectarine--a must for home orchards. Ripens early to mid July. 300 hrs. Self-fruitful. (Zaiger) Available on Lov. Sensational mid season yellow freestone; very high scoring in taste tests. Heavy bearing tree with very showy double pink flowers. Superb, dark red skinned fruit is sweet, with unusually rich flavor; consistently the best flavored yellow nectarine--a must for home orchards. Ripens early to mid July. 300 hrs. Self-fruitful. (Zaiger) Available on Cit. Popular yellow freestone nectarine with large fruit. Harvest firm-ripe and tangy or soft-ripe and sweet with rich flavor. High scoring in taste tests. Ripens in late July/early August. 500 hrs. or less. Self-fruitful. Available on Lov. Popular yellow freestone nectarine with large fruit. Harvest firm-ripe and tangy or soft-ripe and sweet with rich flavor. High scoring in taste tests. Ripens in late July/early August. 500 hrs. or less. Self-fruitful. Available on Cit. Firm, yellow freestone with excellent quality. One of the highest scoring nectarines in DWN fruit tastings. Ripens in mid July. Has large showy blossoms. 650 hrs. Self-fruitful. Available on Lov. Sweet, firm, yellow, semi-freestone; one of the highest scoring nectarines in DWN fruit tastings. Cold hardy Canadian variety has showy, large, single pink flowers in spring. Tolerant of bacterial spot and brown rot. Ripens with Redhaven peach in early July in Central California. 800 hrs. Available on Lov. Superb white fleshed freestone; consistently one of the highest scoring fruits at DWN's taste tests and three time taste test winner. Large, firm nectarine, with sweet, rich flavor; a connoisseur's delight. Dull red and cream colored skin. Ripens in mid to late July. 650 hrs. Self-fruitful. (Zaiger) Available on Lov. Superb white fleshed freestone; consistently one of the highest scoring fruits at DWN's taste tests and three time taste test winner. Large, firm nectarine, with sweet, rich flavor; a connoisseur's delight. Dull red and cream colored skin. Ripens in mid to late July. 650 hrs. Self-fruitful. (Zaiger) Available on Cit. Consistently very high scoring in taste tests. Firm yellow freestone nectarine with bright red skin. Flavor is rich, tangy and sweet, one of the best. Winter and frost hardy; very reliable producer. Ripens in early July. 700 hrs. Self-fruitful. Available on Lov. Consistently very high scoring in taste tests. Firm yellow freestone nectarine with bright red skin. Flavor is rich, tangy and sweet, one of the best. Winter and frost hardy; very reliable producer. Ripens in early July. 700 hrs. Self-fruitful. Available on Cit. Taste test flavor winner. Sprightly sweet, intense, spicy flavored, yellow meated freestone nectarine with red over yellow skin. Ripens late Aug./early Sept. 600-700 hrs. Self-fruitful. Pat. No. 9437 (Zaiger). Available on Lov. Taste test flavor winner. Sprightly sweet, intense, spicy flavored, yellow meated freestone nectarine with red over yellow skin. Ripens late Aug./early Sept. 600-700 hrs. Self-fruitful. Pat. No. 9437 (Zaiger). Available on Cit. Very cold and frost hardy with late bloom. Crops after sub-zero winters. Large, red skinned yellow freestone nectarine with rich, tangy flavor. Very high scoring in taste tests, highly recommended. Ripens mid-July. 800 hrs. Self-fruitful. Available on Lov. Very cold and frost hardy with late bloom. Crops after sub-zero winters. Large, red skinned yellow freestone nectarine with rich, tangy flavor. Very high scoring in taste tests, highly recommended. Ripens mid-July. 800 hrs. Self-fruitful. Available on Cit. Attractive red skinned yellow freestone nectarine. Aromatic, intensely flavored with nice acid-sugar balance. Dependable, long time favorite in warm winter southern Calif. climates. Ripens late July/early Aug. 250 hrs. Self-fruitful. Available on Nema. Attractive red skinned yellow freestone nectarine. Aromatic, intensely flavored with nice acid-sugar balance. Dependable, long time favorite in warm winter southern Calif. climates. Ripens late July/early Aug. 250 hrs. Self-fruitful. Available on Cit. The first donut style nectarine from Zaiger Hybrids! Outstanding early season variety has white flesh that is sweet and juicy. Tree sets at a young age and produces heavily. Thinning is required for large fruit size. Red skin over a blush of yellow. Ripens late June, early July. 500 hrs. or less. Self-fruitful. Patent pending. Available on Cit. Taste test winner. Sweet, juicy, early season white freestone nectarine; longtime favorite in southern Calif. Ripens in late June, 2-3 weeks before Babcock. 250-300 hrs. Self-fruitful. Available on Nema. Taste test winner. Sweet, juicy, early season white freestone nectarine; longtime favorite in southern Calif. Ripens in late June, 2-3 weeks before Babcock. 250-300 hrs. Self-fruitful. Available on Cit.